Inversion Therapy For Back Pain - What Are The Expected Results? Do you suffer from chronic back pain? Do you have sciatica or scoliosis? Maybe you have just noticed lately that lingering acute symptoms keep resurfacing, and you want to take action. As our bodies age, our spines compress. It's all that moving, walking around, gravity, etc. Inversion therapy is supposed to provide certain key benefits that relieve back pain symptoms and improve circulation. Inversion therapy is supposed to stretch the spine and provide traction. Theoretically, this helps to fight inflammation, and it is supposed to help remove the waste from around the spine. Did you know there was waste buildup near your spinal discs? At the same time, one of the claims is that this type of therapy also provides for more protective fluid around your spine. Increased circulation, as mentioned, is yet another benefit. If inversion therapy were able to increase circulation, that could have an impact on reducing back pain symptoms. Have you taken a look at the studies? They are interesting, and they seem to show that a reduction in back pain isn't the only key result. For example, one study talks about how people experienced improved strength and also better torso flexibility. In order for back pain symptoms to go away, the spine must be in better health. That being said, improved spine health is one of the benefits of inversion therapy. It's no secret that we put pressure on our spinal discs in a number of ways, day in and day out. If this type of therapy were able to relieve that pressure, then it would definitely be a breakthrough. Along with better spine health comes increased flexibility. One of the benefits of improved flexibility is better posture. Bad posture can result in even more back pain. Increasing flexibility would play a role in breaking the cycle here if you think about it. And you don't need to be suffering from chronic back pain to realise that these benefits are important when it comes to everyone's spine health. One of the claims about inversion therapy is that it can possibly help reduce a person's need for back surgery. There are all different types of conditions and pain symptoms, and each individual case is different. One study I found on the matter deals with people who suffer from what's known as lumbar disease. Inversion therapy was administered for a six week period, and the results were positive in terms of a reduced need for surgery. While that may sound promising, it's important to mention that the benefits aren't conclusive nor are they concrete, cure-all solutions. If you are going to want to try inversion therapy, you need to first speak with your doctor. He or she has the best knowledge and advice to give about your condition and individual symptoms and their progression. If inversion therapy is an option for you, then you can move forward with trying it out. Remember that the results are supposed to take time, and so you're going to have to stay at it in order for the therapy to have a chance to work. Hopefully, inversion therapy works out for you, and you notice a big difference in your symptoms over time. It's also important to realise that there are different types of inversion therapy equipment and various techniques as well. Inversion tables and inversion chairs are the two most common types of equipment. There are also what's called gravity boots. Not only is knowing the different types of devices important, but you will want to look at what manufacturers and specific products are available. Do you plan on buying your own device for home use, or do you plan to use a device at a rehabilitation facility? As more and more young adults most particularly women are engaging in more sports on a year-round basis, a tear to the anterior cruciate ligament (ACL) is increasingly becoming common. Because the recovery process of ACL injury involves intense effort and it is time-consuming, an athlete is likely to cringe on recovering once he or she notices the damage. However, most of the times, restoration of the ACL or surgery is not required. A patient and doctor can decide whether an operation is needed based on the desired level of activity and the severity of damage. What Causes an ACL Injury? A tear to the anterior cruciate ligament is typically a knee injury that is associated with sports. About eighty percent of ACL injuries relating to Sports are non-contact which implies that the tear happens without any physical contact with another person such as collision during basketball. Oftentimes, ACL injury happens during landing or pivoting from a jump. During the damage, the knees give out from underneath. While taking part in competitive sports, female athletes are more likely to experience ACL tear. The reason why female athletes are more prone to ACL tear is still a mystery. Some scientists attributed this fact to hormonal related, strength and biomechanical but it probably has to do with all these three factors. How is an ACL Injury Treated? Within a few weeks or days, some individuals with ACL tear will begin to feel better. Because the knee swelling has subsided, some patients may start to assume that their knee is completely healed. However, this may be the point when knee giving way or instability may begin or even worse. If you have never experienced an unstable knee or it rarely occurs, and you don't take part in multi-directional activities that patently uses ACL, then there will be no need to undergo an ACL restoration surgery. The ideal way of avoiding ACL restoration surgery is undertaking a comprehensive ACL- Deficient Knee Rehabilitation Program that has to do with high-level balance retraining, proprioception, and leg strengthening as well as functioning enhancement and sport-specific agility. A physiotherapistcan design an effective ACL tear exercise plan that will be most effective for you. The method applied in treating ACL tear without surgery is known as conservative management and is often guided by a Physiotherapist. When at a tender stage, the ACL tear recovery exercises are often painful, repetitious and sometimes intense. Initial therapy will be focused on regain any loss of movement of the knee and reduce the swelling while further treatments will aim at increasing stability, power and strength, particular to your goal activity. Similar to the post-surgery program, this recovery process typically takes six months but returning to normal operations can occur at about three months mark. The aim of the rehabilitation exercise after an ACL injury is for the individual to return to their former level of activity be it work, sport or elite and avoid any future occurrences. For more insight about how to treat your ACL tear without going through the troubles of reconstructive surgery, contact Kuer Physio Harley Street. Most times, people of all ages complain of pain on their hip and back. Most often, the culprit is sciatica, and sciatica symptoms in the hip come with a very sharp pain at the top of the gluteal muscle in the L4 and L5 vertebrae. So many factors can cause sciatica such as pregnancy and inflammation. Sciatica can occur during pregnancy. If the shape of the uterus or the position of the baby compresses the nerve, it can lead to sciatic pain. Inflammation of portions of glutes and the hips can also cause sciatic pain, but because the sciatic nerve is deep, inflammation may be deep instead of the superficial area of the anatomy. Inflammation tends to occur in this area when the nerve is suppressed, and this can lead to a sharp pain from the hip straight down to the back of the leg. The hip is a huge supporting unit to all core area in the human body. As a baby, you first learn to sit up and depend on your hip muscles, which causes no harm. As grown up, frequent activities like squatting, cycling, and running can disrupt the muscles inside and outside the pelvis, which may result in severe pain. If you suffer from the sciatic nerve, hip pain, and hip injury, here is a guide on how to get treatment. In most cases, sciatica pain may increase when there's a lot of bending on the hip joint. This is why yoga is one of the effective treatment recommended for sciatica symptoms on the hip. Yoga treatment in sciatica involves gentle, deep back bending as well as mild external hip rotation. The cobbler pose and bridge pose is often the most prescribed and effective means of sciatica treatment. Another treatment guide is forward folding, and it's contraindicated for lumber bulge. This is working effectively to engage the muscles of the core, and it's also a vital aspect of the healing of hip injury, sciatica nerve or hip muscle pain. People with "stronger abs" may need to reevaluate the use of this method (Transverse Abdominis), which is the deepest part of the core for the strengthening of the back. Strengthening of the low back and opening of the hamstrings help minimize tightness in the outer hips area and restore functions and natural curvature of the spine. Whenever you feel tightness around the muscle at the front of your hip, chances are that you are dealing with Psoas, also known as the piriformis (Another symptom of sciatica of the hip). Piriformis symptom is an inflammation of the muscle that compresses the sciatic nerve. Symptoms include pain in the buttock and hip area (That's where you feel most sciatic pain) and more down your leg. Basically, sciatica hip pain is caused by inflammation and the most suitable treatment for such inflammation is rest. When you get enough rest, it can help manage the pain, and with yoga and treatment, you are sure to get relief from the previously inflamed muscle groups. If you are dealing with sciatica, chances are it will occur again in the future. So learn to listen to your body and check for signs of inflammation before you start getting serious pain. Doing so will help prevent the cycle of injury in your body. If your sciatica is as a result of a bulging disc in the lumbar spine, it's important to work with a doctor so that he or she can tell you when to reintroduce motion to specific area of the body. For more information contact KUER physio. Becoming a doctor is a popular career choice for many young people, but it’s also undeniably difficult. Not only does a young adult need to be incredibly intelligent to make it onto a medical degree course, they must also demonstrate the determination and staying power to last the many years it takes to become fully qualified. If you are a proud parent looking to support your child as they take their first steps towards fulfilling an ambition to become a doctor, you may ask what it is that you can do to lighten their load. One way to do this is to ensure your teen doesn’t go into their new course as a complete novice. Here is how to prepare your child for studying medicine at university. The medical field is a wide one, with many different options and routes to choose from, so chances are your teen is feeling pretty overwhelmed right now. You may not have all the answers they need, but you can help them arrange a meeting with someone who does, like an admissions consultant or guidance counsellor. If you know any medical professionals, ask them if they would be happy to speak with your son or daughter, too. Summer programmes are often the best way to gain some hands-on experience of what university will be like. Cambridge Immerse offers a two-week summer medicine course, among other subjects. This will give your teen a taste of the university lifestyle as well as giving them a head start on the degree course itself. Grades are an important factor in any student’s medicine application, so it’s absolutely vital that your child studies to get the A-level results they need, particularly in the science subjects. Help them draw up a revision plan and make sure they stick to it. A medical degree requires a huge amount of reading, so try to get your teen used to it now. Get your child in the habit of intensive reading by getting them to read textbook chapters out to you, then make notes together. If your teen really struggles with intensive reading, consider hiring a tutor. While good grades and an appetite for reading are extremely important when applying to study medicine, bear in mind that every other applicant will also have these skills. To help your teen stand out, consider enrolling them in extracurricular activities. Whether they have a talent for sport, an ear for music or simply love to help others through volunteer work, support their efforts away from the classroom. If you don’t already, start buying newspapers to help your teen stay up to date on current issues in the medical field. Or, you could even encourage them to download newspaper apps and those for esteemed medical journals, so they can get in the habit of flicking through them like they would with Facebook or Instagram. References are an important way of backing up all the positive things your teen will say about themselves in their application. Usually these cannot be from relatives, so you can’t write one yourself, but you can still help your child find people who know their strengths, like teachers or employers. There are a lot of documents involved in a medicine application, so get started on it early to avoid any last minute panic. Your teen will most likely need a letter of recommendation, exam scores and references, which can be time consuming to put together. Not everyone gets in to university to study medicine, so if your child doesn’t get accepted straight away it can be really disappointing for them. Try to keep them feeling positive and explore other options, such as clearance, exam resits or a gap year. As a physio I use the one leg squat as part of my assessment tool kit daily. It not only gives me a good insight into balance and lower limb coordination but also allows me to have a finer look into: foot posture, glut activity and lower limb alignment. This is a great exercise to help strengthen the core and is functionally appropriate for runners. Few runners actively focus training around a strengthening regime which I have always found a little odd. After all, if Mo Fara spends 70% of his time in the gym working on core strengthening then we really should take heed! The one leg squat is a great exercise not only to activate the core but also to allow us to practise functionally for our sport. After all we do spend 50% of time on one leg when running. 1. Don’t hold your breath, sounds silly but the majority of clients I assess hold it for up to three reps. It won’t help you! 2. As you bend the supporting knee focus on maintaining true alignment, an easy way to help with this it to “squeeze” the knee outwards when ascending and descending in and out of the exercise. 3. Your weight should be slightly more on your heals in order to active you bottom muscles. 4. Careful not to overly arch the back by either falling into the hips or doming the mid back. 5. Relax the foot. Think of the foot as a lily pad. It’s strong, widely spread and there is no tension held with in it. When you try to scrunch up your toes in your shoes to attain balance you are only achieving a reduction in foot surface area. If this area is smaller it is harder to balance on - think of ballerinas that balance on their toes! So have a try at the above and see how you get on. Any questions just fire them across to me. Happy squatting! Sport Therapy is a specialized practice that helps in evaluating, preventing, curing and maintaining the physical fitness of athletes or individuals engaged in sport and exercise related activities. 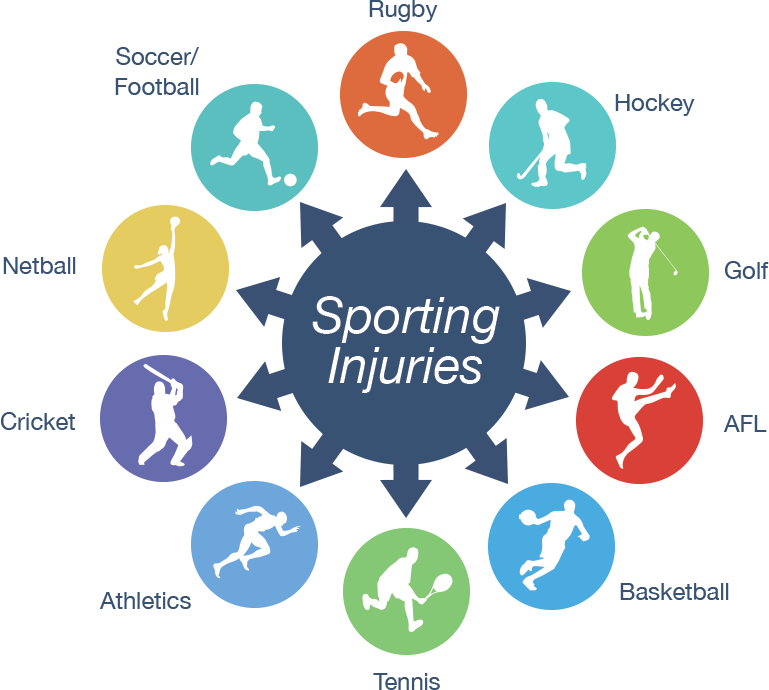 Sport therapy is important to reduce the risk of sport injuries and also help to maintain the shape of injured athletes while recovering from their injuries. Therapy can also help injured athletes manage their pain and prevent permanent deformity. Sport therapy also helps to manage recurring problems. Strains: Strains happen when there is a pull or tear of the tendon. This is the tissue that attaches the muscle to the bone. Sprain: this injury happens to the ligament joining two bones together. The common parts of the body affected by sprain are the wrists, knees and ankles. Shin splits: this injury is commonly felt by runners. This is pain felt in the lower leg. Other kinds of injury developed in sports include fractures of the bones, dislocation of joints and Achilles tendonitis. Now that you have been well acquainted with the common injuries suffered in sport, the following section is going to cover the various methods of treating them. As mentioned above, they are therapies. Cryotherapy is the application of ice to injured parts. This is used to achieve therapeutic effect on the affected area. Cryotherapy is also referred to as the cold therapy. As the name sounds, electrotherapy is the use of electricity for the treatment of soft tissues. There are several forms of electrotherapy including tens, interferential, ultrasound, magnetic field and interferential. Sports massage is often used in the treatment in soft muscle injuries. When it comes to sports massage, timing, technique and aim are very important. The timing refers to whether the massage is being administered before the injury or during recovery. Injuries to weak joints are often supported by sports taping techniques. Strapping is done with adhesive tapes. Strapping is done to prevent injuries to the joints especially the wrist and ankle. A lot of sports use taping as a form of injury treatment. Examples can be seen in karate, where taping of the foot is necessary to prevent injury. Other sports that use strapping and taping as a form of injury treatment include basketball, baseball and soccer. It is important to know that adhesive tape is often applied to help fast recovery from sprains. Alternative therapies used in the treatment of sport injuries include: Acupuncture, Aromatherapy, Acupressure, floatation therapy and Myofascial release. Acupuncture is a major component of Chinese medicine and it involves the insertion of needles at strategic points on the body. These pins are extremely tiny. Though acupuncture is used for a wide range of treatment, it is used primarily to relieve pain. Drugs are also often used to provide therapeutic effects. Common drugs used as therapy include Aspirin, Antibiotics, Morphine, Ibuprofen, Codeine and Corticosteroids. Hydrotherapy is the use of water in the treatment of sport injuries. There is quite a wide range of hydrotherapies including treatments such as the colonic hydrotherapy and the steam room. As often used in physical therapy, here, hydrotherapy is referred to as the use of water in the rehabilitation of neural and musculoskeletal systems. Even the most physically fit sport enthusiast seeks to avoid sport injuries. The paramount way to do so is using consideration before participating by preparing the body before strenuous activity. There are numerous steps needed to avoid a sports injury. The most imperative being the need to properly warm-up beforehand. Failing to warm up is the most common reason sports injuries occur. Warming up allows for increased blood flow to reach your muscles, as well as increase the elasticity of the muscle fibres. Increasing circulation and flexibility will considerably reduce your risk of pulling or straining a muscle. After sufficiently warming up it is important to add some gentle stretching activities. They should be principally focused on the muscles you will be using extensively during your sport participation or exercise program. Gently stretch your muscles and tendons, this assists in lengthening muscles and tendons, allowing for a lower possibility of preventing injuries during exercise or sports participation. Another way to help avoid a sports injury is to make sure, if the sport activity you are participating requires physical contact with other participants, you are using the proper equipment and are using it correctly. Sports such as football or hockey require proper head gear, skin guards, as well as other protective gear. If you are participating in boxing it’s important to ensure you are using correctly fitted gloves and appropriate dental protective gear. It is also vital to make sure to wear suitable shoes required for the sport you are participating in. If you are a jogger, having the proper and appropriate running or jogging trainers is a must. The proper trainer can offer needed support for your feet and ankles, leading to a less likely chance of twisted or sprained ankle. Most sports and exercises, especially when working out in a gym, involve certain techniques. It is extremely important to make sure you understand and are using the techniques correctly! Not doing so can lead to pulled muscles, sprained joints and in some cases, even broken bones. One often ignored facet of participating in sports or exercise is stressing the importance of not over-reaching yourself! Our bodies know what our physical limits are. It’s important to ‘listen to your body’ and be aware of what your individual physical limits may be. If you are a novice to physical activity, or have not undertaken strenuous exercise or activity is some time, you will need to slowly build up your stamina and strength over a period of time. Once you notice your fitness begin to increase, it will be safe to intensify your level of activity for longer periods of time. Be sure to hydrate often. Water is vital to the body, particularly one involved in strenuous activities. If you are participating in sports or exercising in extreme heat it is essential to make sure your body is getting the hydration it needs to prevent dehydration, which can lead to a significant reduction in mental and physical fitness. A cool-down after strenuous activities is also essential to make sure your body recovers steadily and to prevent muscle stiffness. Is Lack of Exercise The Major Cause of Obesity? There is a saying “you cannot exercise yourself out of a poor diet”. Studies show that obesity levels in western populations have drastically increased over the last 30 years while exercise levels have remained relatively unchanged. The main culprit is diet. The standard UK diet is over loaded with simple carbohydrates, sugars and trans-fats. Glucose was historically the prime form of sugar that made up a small part of our diet. In the right quantities, glucose can be beneficial to the body as it is a source of energy for the liver, skeletal muscle and the brain. It is also stored in the liver and skeletal muscles as glycogen, a simple carbohydrate that can be broken down to glucose when needed. If glucose intake, and blood glucose levels exceeds a crucial level, then it becomes toxic to the body. The liver then has to metabolise and detoxify it and consequently stores it as triglyceride fat in our adipose cells (fat cells). The more glucose that needs to be metabolised the more adipose cells are produced for storage. Once adipose cells have been produced they remain available for storing fat, so even if you diet and lose some of the stored fat, these storage cells are readily awaiting the return of poor eating habits to store more fats. Glucose is in abundance in the standard UK diet. Simple carbohydrates such as white pasta, white bread, potatoes and easy cook white rice break down rapidly on digestion to glucose. Over the last 30 years a major source of the sugar in our diet has come from fructose syrups. Fructose is processed by the food industry from sweet corn. It is very toxic to the body and has no nutritional value. The liver metabolises it, after which it is stored as triglyceride fat. Experts state that regular physical exercise is beneficial to reduce the risk of developing certain cancers, cardiovascular disease, type2 diabetes and dementia, but it does not promote weight loss. The food industry spends billions of pounds promoting sugar drinks and foods through sponsoring sporting events and having athletes endorse their products. This creates the illusion that exercise is what counts, and these energised drinks and foods support physical health. However science tells us that it is where the calories come from that count. Sugar calories promote fat storage and hunger. Healthy fat calories induce fullness and satiation. Practice manager and owner of dentistharleystreet.com - we provide an exclusive service including various treatment and referral plans. Over the last 9 years I have been providing a marketing and business consultation service to help new businesses in the health sector to generate new patient enquiries.